A weak El Niño is likely to continue through the Northern Hemisphere summer 2019 (65% chance) and possibly fall (50-55% chance). Weak events can still produce moderate or strong temperature or precipitation impacts in some places, but such impacts are less likely overall during weak events. (image at left) Difference from average sea surface temperatures at the equator in the tropical Pacific. 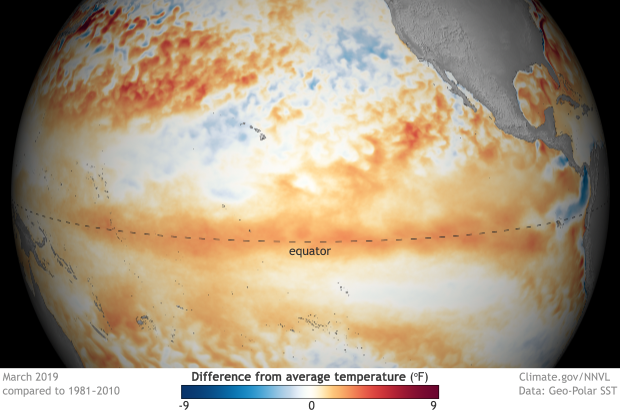 What is El Niño in a nutshell? 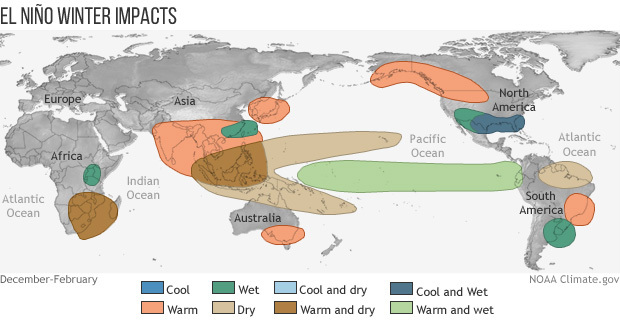 El Niño is anchored in the tropical Pacific, but it affects seasonal climate "downstream" in the United States. This map shows some of the precipitation and temperature impacts we may experience if El Niño develops this winter as predicted, but not all impacts occur during every event, and their strength and exact location can vary. El Niño and La Niña have their strongest impact on global climate during the Northern Hemisphere winter. The map at left shows some of the precipitation and temperature patterns that might occur this coming winter if El Niño develops as predicted. However, not all impacts appear during every El Niño event. 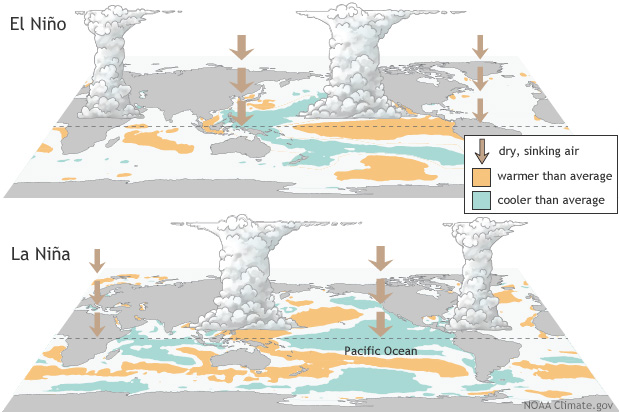 A hefty pool of warm water below the surface of the tropical Pacific boosts the odds that the current weak El Niño will persist through summer 2019 and possibly fall. Summer El Niños can affect the Atlantic hurricane season. 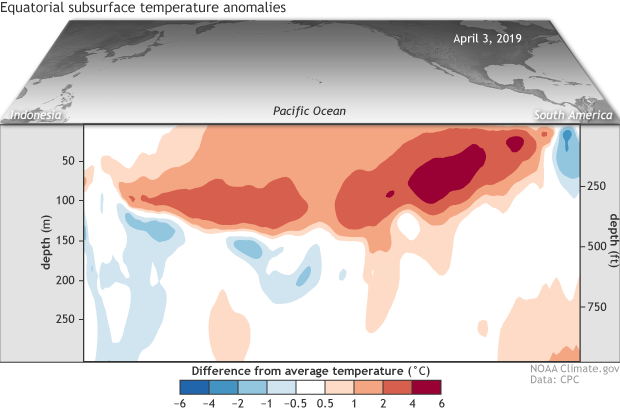 (left) Temperature anomalies in the upper 300 meters (2,300 feet) of the tropical Pacific Ocean over the 5-day period centered on April 3, 2019. --Select a region of interest--AlaskaEastern RegionGreat Lakes RegionGulf of MaineHawaii and Pacific islands regionMidwestMissouri River BasinSouth/Southern PlainsSoutheast RegionWestern U.S.